The eyeball has three layers. The innermost layer is the retina. The middle layer is the uvea. The outer layer is the sclera and cornea. There are ten layers to the retina. The retina contains receptor cells, neurons, pigmented epithelium and supporting cells. The retina consists of the rods, cones, bipolar cells, ganglion cells, horizontal cells, and amacrine cells. The receptors for vision are the rods and cones. The rods are located on the periphery, and are not color sensitive. The cones are the receptors for color. Muller's cells are part of the retina. The anterior pigmented portion of the retina is called the ora serrata. The nervous element in the retina consists of bipolar cells and ganglion cells. The neurons in the retina are bipolar. A bipolar neuron has two process that branch from it: an axon and a dendrite. Bipolar neurons are not very common and are found in some of the organs for special senses. Bipolar neurons are found in the retina, inner ear, and the region of the nose involved with smell. The fovea centralis is part of the retina. There are only cone cells in the fovea centralis. It is the site for maximal visual acuity. 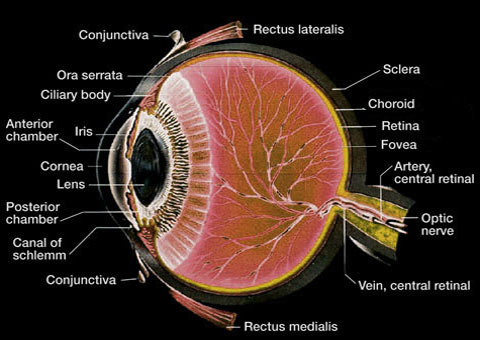 The uvea is the middle layer of the eyeball. It consists of the iris, choroid and ciliary body. The most anterior portion of the uvea is the iris. The iris is the colored part of the eyes. The vascular pigmented structure of the uvea is the choroid. The inner layer of the choroid is the lamina vitrea. The lamina vitrea is also referred to as Bruch's membrane. The ciliary body is a thickening in the uvea. It contains the ciliary muscle. The ciliary muscle is within the ciliary body. The ciliary muscle adjusts the shape of the lens. The sclera is the "white of the eye". The sclera is composed primarily of collagen fibers. The cornea is transparent. The cornea is avascular. The cornea is composed primarily of collagen fibers. There are five layers to the cornea: epithelium, Bowman's membrane, substantia propria, Descemet's membrane, and endothelium. Bowman's membrane and Descemet's membrane are acellular. The majority of the cornea is from the substantia propria. The endothelium is a simple epithelium. The surface of the cornea is covered by a non keratinized stratified squamous epithelium. The lamina cribrosa are small openings within the sclera where the fibers forming the optic nerve travel through. The glands of Moll in the eyelid are apocrine sweat glands. The optic chiasm is the anatomical region shaped like an"X" where the two optic nerves join. The site where the optic nerve leaves the eyeball is the optic disc. This region is also called the anatomical blind spot. Since there are no photoreceptors at this spot, it causes a blind spot in the visual field. The region behind the lens is the vitreal cavity. The chambers anterior to the lens are the anterior chamber and posterior chamber. The iris separates the anterior chamber from the posterior chamber. The zonular fibers are the suspensory ligament of the lens. Aqueous humor collected from the anterior chamber via the canal of Schlemm.